If you own a large property, owls can pose a threat to small livestock. Owls are particularly difficult to remove from a property because they are secretive and nocturnal. Even if you know you have an owl problem, it can be difficult to determine the location or motives of the owls. 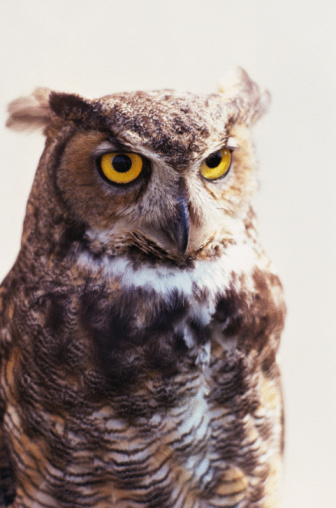 Since owls are federally protected species, you will not be able to shoot them without a special permit. Fortunately, once you have identified them as a problem, there are ways to scare them off of your property. The horned owl is a predator that is known to eat livestock and household pets. Secure your livestock. While you work on removing the owls from your property, it is important to make sure that your small fowl and poultry are secured, especially at night when owls usually hunt. If there is no chance that the owls can get your livestock, it is possible that they will leave on their own in search of better hunting grounds. Modify the owl's habitat. Owls cannot live on your property without somewhere to perch. Find all possible sources of owl habitat and do your best to modify or remove them. You can put spikes on telephone poles to discourage perching and remove all snags from your property. Scare the owls. Install a scarecrow in your yard near your livestock to discourage the owls. They are less likely to attack or remain on the property if they feel threatened. If you see the owl during daylight hours, you can try shooting off fireworks or other pyrotechnics to scare them. Trap the owls. If all else fails, you can hire an experienced trapper to catch the owls and remove them from your property. Trapping can be time-consuming, but is worth trying as a last resort. Daisy Buchanan has worked as a staff writer for "The Umbrella," an arts newspaper in Portland, Ore., and as editor-in-chief for "Living Mosaic," an academic journal. Buchanan holds a Bachelor of Arts in environmental studies from Lewis and Clark College.